There's no need to pay the $18 fee for the Central Park Zoo -- New York's more of a concrete jungle than you can imagine. Throughout the city lies dozens of intriguing pieces of animal artwork, some dating back a century, others only months old. A few of these works have been cruelly stolen, lovingly refurbished, or patted by thousands until their bronze features are shiny with wear. Sometimes it pays to look up from those smartphones; you may be rewarded with a startling sight. Here are 12 of our favorite animal sculptures -- and where to find them -- in Manhattan. Morningside Park, near the 114th St. entrance This seven-foot tall statue in Morningside Park features a bear discovering a faun (that's a man-goat hybrid) with musical pipes at his side -- and even comes with a working water fountain. The faun looks surprisingly youthful, despite being nearly a century old. In 1914, friends of Alfred L. Seligman, the vice-president of the National Highways Protective Association, commissioned the work from sculptor Edgar Walter for a mere $2,000. For the most endearing detail, check out the bear's claws -- his furry feet are sculpted with individual toes. Robert F. Wagner, Jr. Park, at the southern end of Battery Park City It sounds like the plot of a (very bad) rom-com: Can a feline and primate find love in the cold, harsh city? Apparently so: an interspecies affair is underway at Battery Park, where this sizable bronze created by renowned ‘60s Pop artist Jim Dine commands attention next to the Hudson River. Longtime New Yorker Dine cast this piece in 1996, after using the odd couple in some of his earlier drawings and sculptures. Bowling Green Park, near Broadway Ave. and Beaver St.
Long before Banksy, there was the bull. 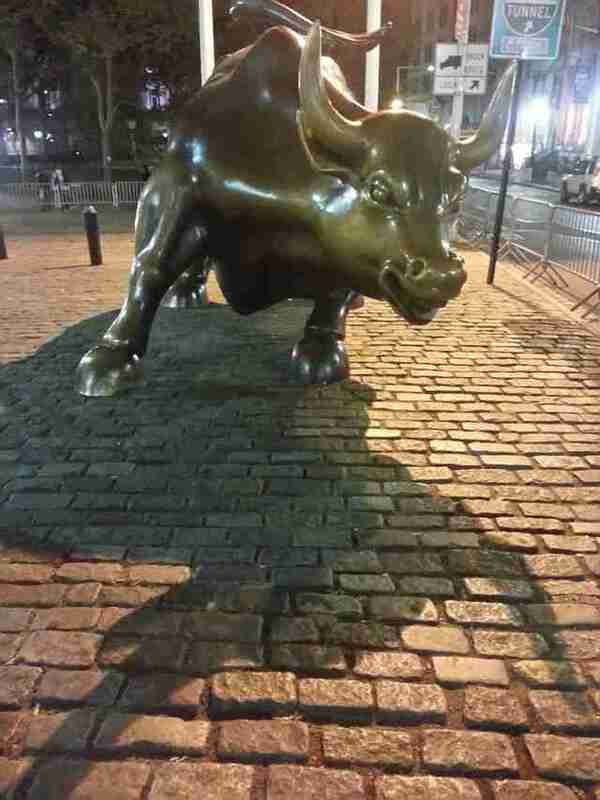 What's now a beloved icon for Wall Street originated as an act of guerrilla art by Arturo Di Modica, who left the bronze sculpture in front of the New York Stock Exchange shortly before Christmas 1989. Tipping the scales at 7,100 pounds and with a snout-to-tail length of 16 feet, the bull took two years to create. Police hauled it away (and the Dow Jones dipped), later placing the beast at Bowling Green, the city's oldest public park. But New York's not the only location to grab the you-know-what by the horns: similar creations are in Shanghai and Amsterdam. As for the N.Y. edition, tourists love it, rub it, even ride it -- and inevitably pose near the bull's balls at its back end. Central Park, near the Children's Zoo entrance High above the arches between the Children's Zoo and the Wildlife Center in Central Park is a band of animals: a hippo violinist, a tambourine-wielding bear, a concertina-playing elephant, a horn-playing kangaroo, a goat with pipe, a penguin drummer, and two bronze monkeys sitting above the clock. Every hour, the animals circle and spin to nursery rhymes, or, during the winter, "Deck the Halls" and "Jingle Bells." One of many gifts to the park from publisher and philanthropist George Delacorte (others are the Delacorte Theater and the Alice in Wonderland statue), the clock started chiming on June 24, 1965 and has stopped rarely since. 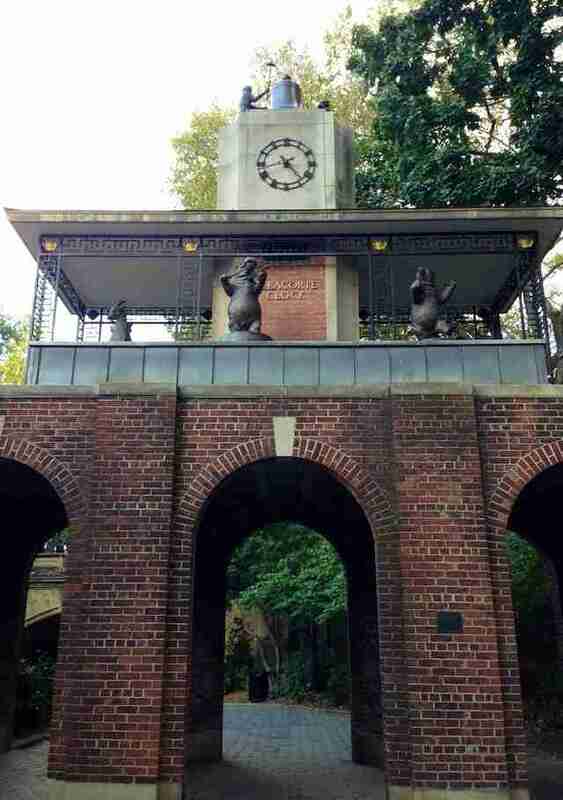 Just a stone's throw away from the Delacorte Clock is one very happy bear. 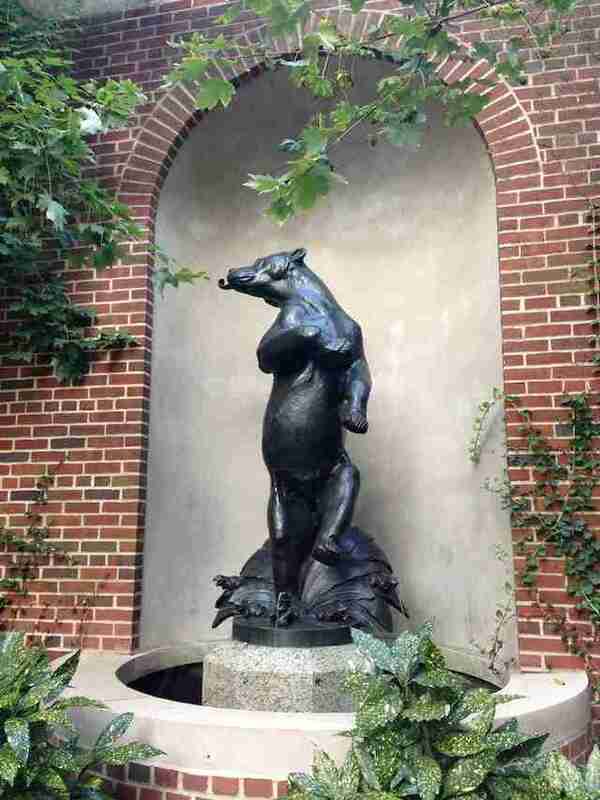 Designed by the award-winning Brooklyn-born artist Frederick Roth, this Dancing Bear created in 1937 is one-half of a footloose pair (the Dancing Goat sits at the zoo's south entrance). 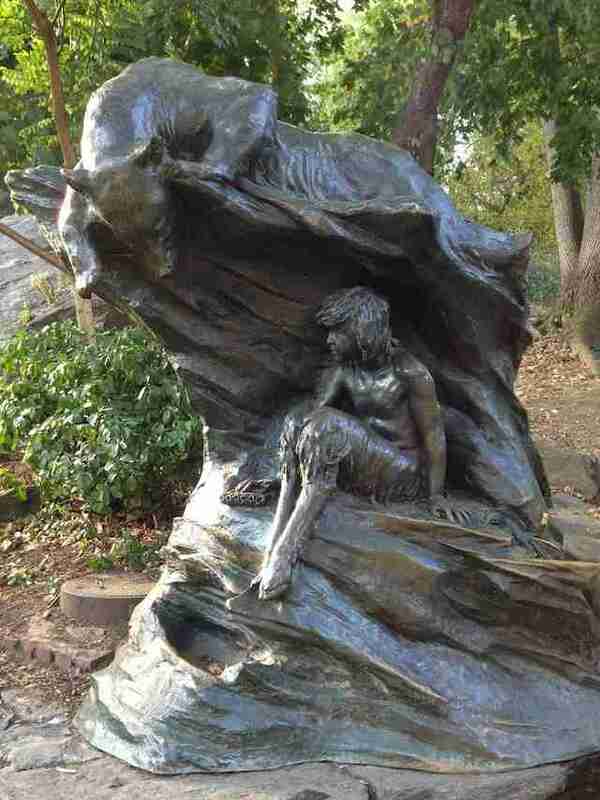 Roth became the chief sculptor for the NYC Parks Department, and worked on creations for the Prospect Park Zoo. The bear and his five amphibian friends who spit water at his feet were refurbished in 1993. Carl Schurz Park, near E. 86th St. and East End Ave. While Peter Pan isn't technically an animal, the boy wonder is certainly friend to them all. 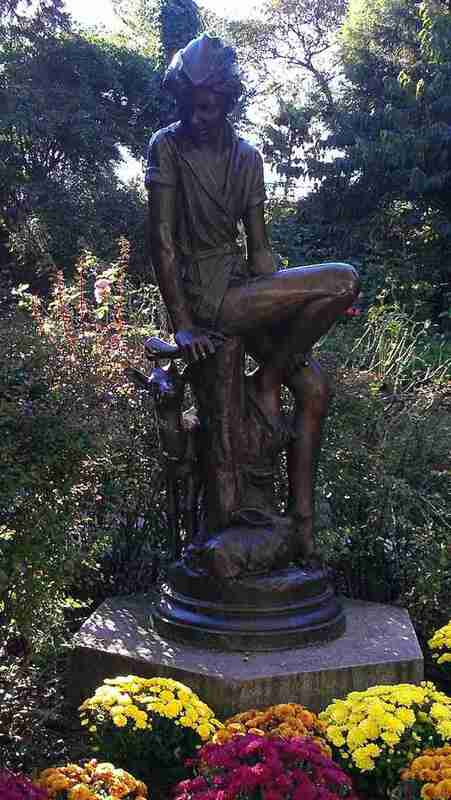 The hero of lost young schoolboys everywhere casually sits with a fawn, a rabbit, and a toad in this work designed by Charles Andrew Hafner in 1928. Originally the statue's home was the Paramount Theater lobby in Times Square, but Peter & co. were moved to the Upper East Side's Carl Schurz Park in 1975. A delicious, only-in-New York mystery occurred in 1998 when the entire statue went missing -- and was later recovered at the bottom of the East River. Captain Hook remains at large. 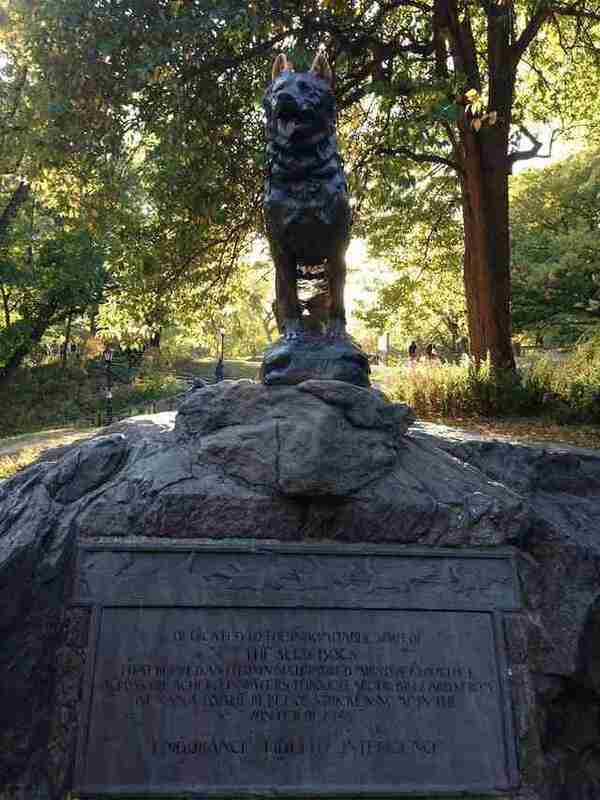 Central Park, near the East Drive at 67th St.
Film fans may recognize this pup from the 1995 animated movie Balto, which depicted his heroic efforts leading a group of sled dogs "six hundred miles over rough ice across treacherous waters through arctic blizzards from Nenana to the relief of stricken Nome in the winter of 1925" (so says the plaque at his feet). The Siberian Husky was one of 200 dogs that helped carry antitoxin serum to Nome in a race against a diphtheria outbreak. 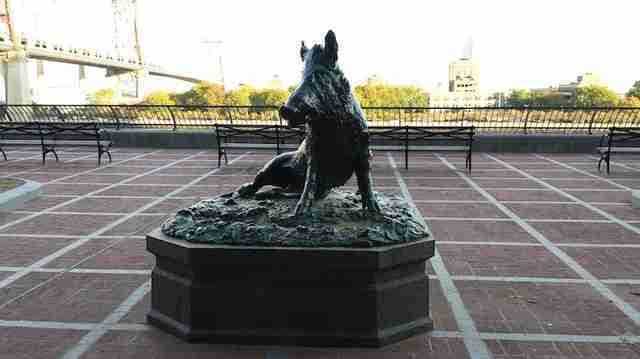 On Dec. 17, 1925, the real Balto came to the unveiling of the beloved Central Park statue, which was created by Frederick Roth. 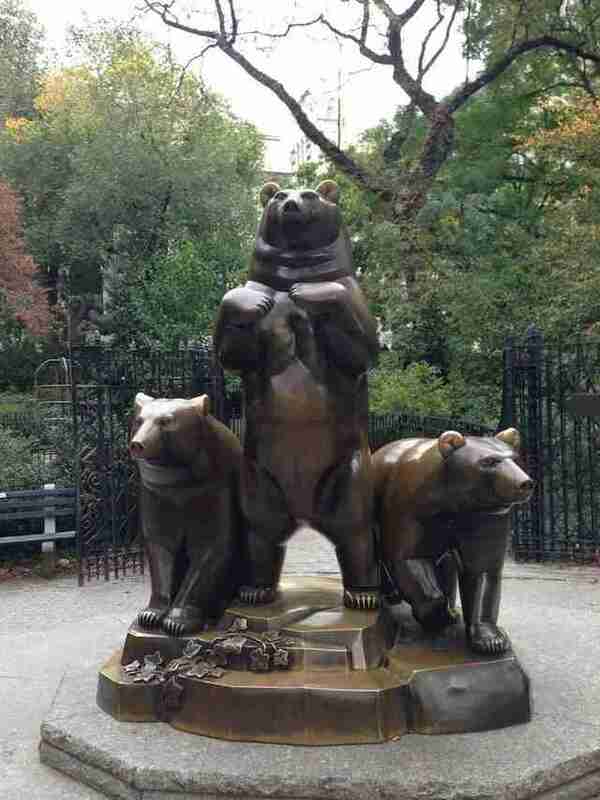 Central Park, Pat Hoffman Friedman Playground at Fifth Ave. and 79th St.
Could there be more bears than pigeons in New York? 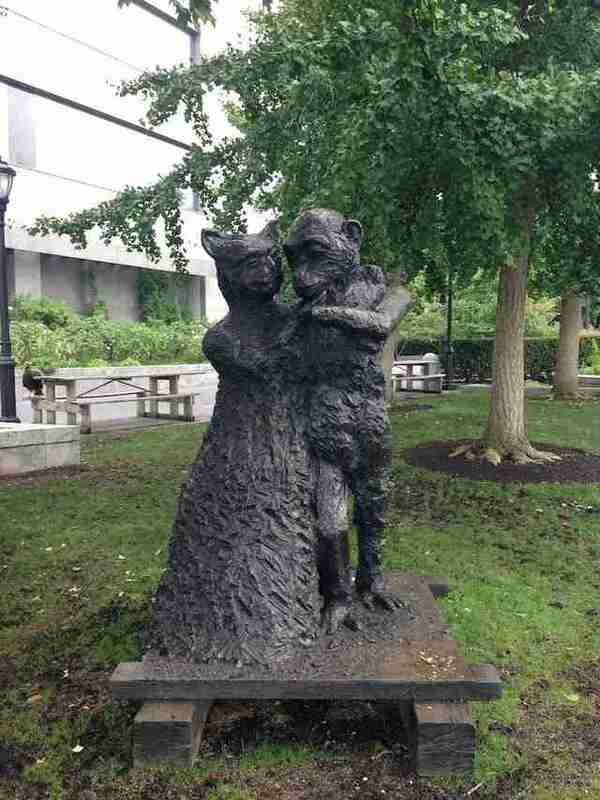 One of the more recently created sculptures around is this one depicting three bears (sans Goldilocks), unveiled to the public in 1990. The bears have some esteemed origins -- their sculptor Paul Manship most famously constructed Prometheus, that golden Titan given prominent placement outside 30 Rockefeller Center. Herald Square, 34th St. and 6th Ave.
Who knew Herald Square was so spooky? 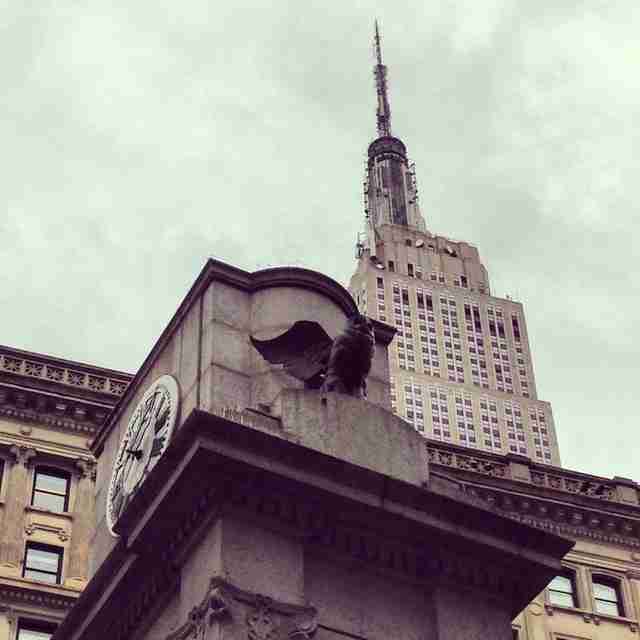 Under the shadow of the nearby Empire State Building, with a Victoria's Secret to the east and Macy's to the west, there stands a parliament of owls. Two stone owls guard the entrance to the square, and atop the giant clock tower and monument are more giant birds of prey with wings outstretched. At night their eyes glow an eerie green. The owls are left over from the old building of the New York Herald, whose publisher James Gordon Bennett was something of an owl aficionado. He even planned to be buried in a 200-foot-tall owl-shaped mausoleum. Now that would have been something. Riverside Park, near Riverside Drive and 91st St. 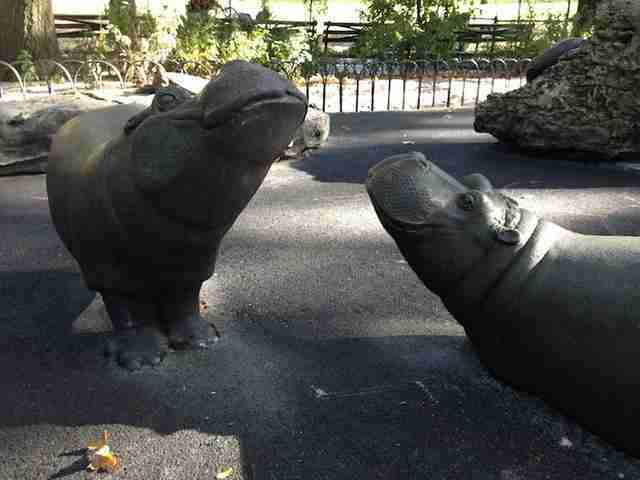 They may be considered one of the most ferocious animals in the world, but this pod of hippos at the children's playground in Riverside Park seems downright domesticated. 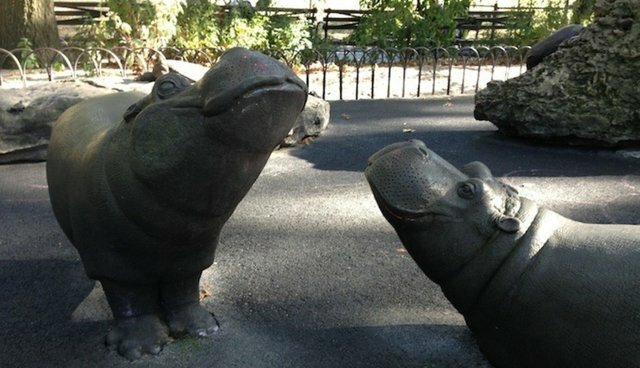 The 14 fiberglass hippos -- which the NYC Parks website takes care to note are of "reduced scale" -- were created in 1993 by the late Bob Cassilly, Jr., who also founded the quirky City Museum full of recycled and repurposed finds in St. Louis, Missouri. Sutton Place Park, near 57th St. and the East River Meet Boar. He's rugged, strong, silent. A real man's boar. He's probably very relieved New York Gov. Cuomo just outlawed hunting and importing Eurasian boars in the state (because apparently that's a real thing). Boar's been living at this postage-stamp-sized park since 1972, and he's seen some things. He even once saw Woody Allen romance his best friend's girlfriend here with views of the Queensboro Bridge (it was a movie, but still). Boar doesn't care that he's a replica of the Porcellino by Renaissance sculptor Pietro Tacca, who even modeled his boar off a statue in Florence's Uffizi Gallery. Boar lets Upper East Siders go about their business. He has just one request: mind the tusks, please. Riverside Park South, near W. 66th St. 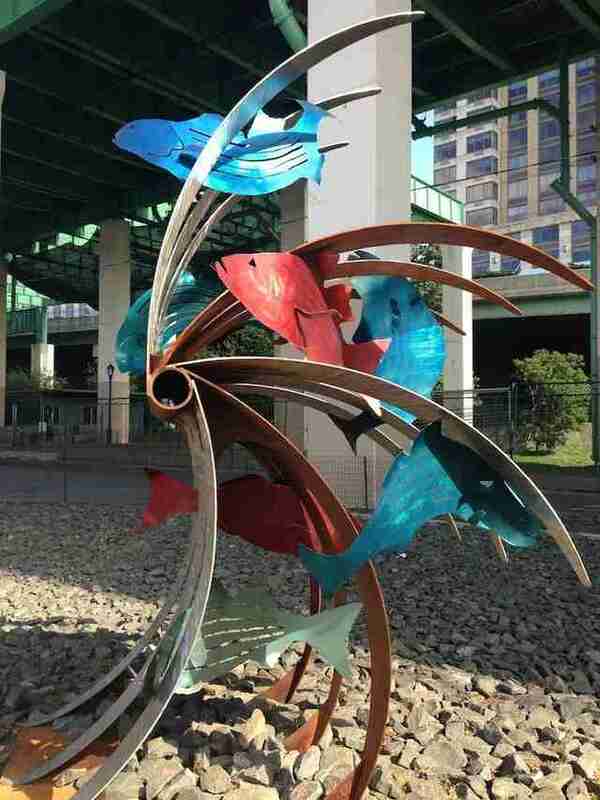 The newest addition to the city is a stainless steel and mild steel structure created by the artist Anne Stanner. Located on a stretch of gravel next to the walking path at Riverside Park, the sculpture is swimming with striped bass in a nod to the Hudson River just a few feet away. The sculpture was installed in June 2013 and will be on view until May 2014 courtesy of Model to Monument (M2M), an initiative by the Art Students League of New York, which is training artists to produce public works through a five-year collaboration with NYC Parks Department. Can humans and animals peacefully coexist in the city? The future looks bright. Did we miss a favorite New York animal sculpture? Join The Dodo and post it, or tweet it with #thedodo.